Tuesday morning, the first story I read about Canada’s new prime minister to be was an online post about an apparently unannounced appearance at a Montreal subway station. Justin Trudeau, the CBC reported, had spent part of the morning greeting commuters in his riding of Papineau, thanking them for their support. It sounded almost schoolboyishly endearing, diligent and sincere, and it’d be an easy thing to deconstruct and dismiss from a cynical political analyst’s default angle. After all, hadn’t Trudeau’s own Twitter feed drawn attention to it, posting three photos of the soon-to-be prime minister posing for selfies with a calibrated range of youthful and ethnic constituents? Wasn’t this 2015’s version of kissing babies? Shouldn’t it make you wonder, if anything, how many backroom strategists and media reps were standing just out of the picture, orchestrating it all? Here, though, is how I’ve chosen to interpret the story: Justin Trudeau went to a metro stop in his riding that morning because he wanted to thank his constituents personally. Because, hard as everyone’s tried over the past few years to find a more malevolent or vain or calculating “real” character behind the handsome, boyish façade, this is actually him. He excels at this kind of politics—enough so to lead the greatest rebound in Canadian political history—because it does in fact come naturally to him. I’m inclined to interpret the moment this way because it is very similar to the circumstances under which I met Justin Trudeau. In the fall of 2011, I had plans to visit Montreal to do some publicity for my then-new book, The Leap. Months before, a friend had mentioned to me that he was at some event where he heard Trudeau namecheck my previous book, The Geography of Hope. So I wrote to Trudeau’s parliamentary office and offered to drop off a copy of the new one while I was in town. An assistant emailed back to say I could come to a particular church in Trudeau’s riding one morning if I wanted to deliver it in person. The assistant explained that when Trudeau was at home, he regularly hosted drop-in sessions of this sort. On the appointed date, I took the metro out to the very end of one of its lines, the Saint-Michel stop (not too far from the Jarry stop where Trudeau was photographed this week). The church, St. Bernardine de Sienne, was several blocks up Boulevard Saint-Michel, a chilly walk past fast-food joints and Vietnamese restaurants and under the imposing concrete of Highway 40. I arrived in the church basement as Trudeau was finishing a conversation with a small group of constituents. It was a broad, low-ceilinged space strewn with long folding tables and hard chairs, one of those offhandedly grim, utilitarian rooms where a surprising amount of political life actually transpires. 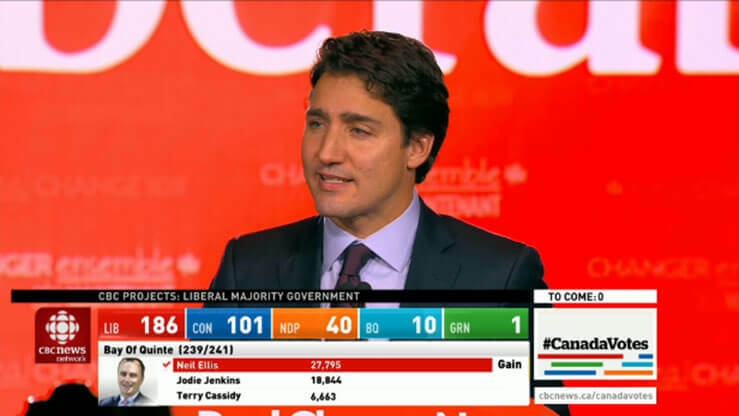 Trudeau was leaned in close over one table, focused on an older woman he was speaking with. The conversation ended in warm hugs all around. Eventually Trudeau came over and we chatted a bit and I handed him a book, and then he excused himself to attend to other constituency affairs. 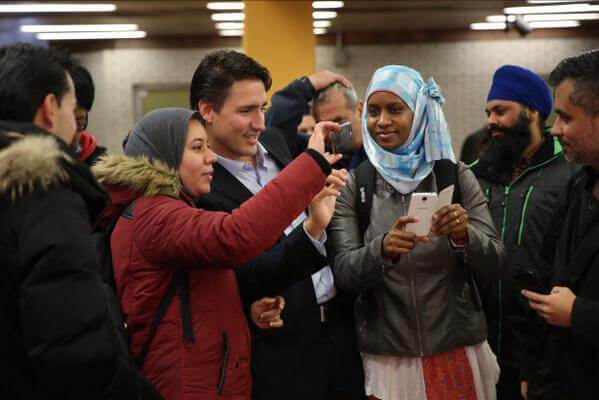 That encounter, brief and mundane as it was, is why I’m inclined to take the subway photo-op—and our new prime minister—at face value. In those unguarded moments, he was pretty much who he has insisted he is since, even as spotlights grew brighter and stages vastly larger. Decent, hardworking. A quintessential Canadian nice guy. A version of the default image many Canadians tend to think of as the embodiment of their national character—though much more charismatic and better looking. Tough enough to throw a solid body check (or punch), sure, but otherwise unassuming and self-effacing, keen to broker compromises and accommodate newcomers and apologize too much. If this is not wholly true of what many Canadians really are, it’s nonetheless an enticing approximation of what many of us aspire to be. And that, I would argue, is a significant reason why Justin Trudeau is about to become our twenty-third prime minister. Nenshi has used Twitter often over the years to repost urgent missing pet notices, a way of putting his immense online fame to positive civic use. Days earlier, he’d been all over the national news, arguing that the Conservatives were taking the federal election into “dangerous” territory with their cynical, divisive rhetoric regarding the niqab ban. Nenshi was speaking most directly about leaving that messy niqab affair in the past, but the sentiment spoke to a broader fatigue. After a decade of Harper’s micromanaged rule, his divide-and-conquer tactics and contempt for collaboration and compromise, his relentless budget cutting and diminishing government, his demonization of all opposition and stifling of all dissent and hostility to almost every form of expertise other than that of electoral politics—after all this, plus whatever laundry list of further outrages nearly 70 percent of voters brought along to the polling station, weren’t many of us voters hoping to get back to our lost pets? To nice guys? To sincerity, to decency, to respect for our differences, to some kind of collaborative politics at least willing to strive toward unity? I might look impossibly naive in a few years, taking our new prime minister’s stated intentions at face value, accepting his sincerity as something more than the usual politician’s veneer. But after a decade of mean, smirking indifference to nearly everything I love about my country, I’m willing to take that risk. Millions of us are, I’d wager. Maybe even a majority. On election night, our new PM promised “sunny ways.” And many of us, one way or another, replied: Phew. We’re ready to trust our prime minister again. You have our support, Justin Trudeau. Don’t squander it.